The title of David Finkel’s new book is painfully ironic. 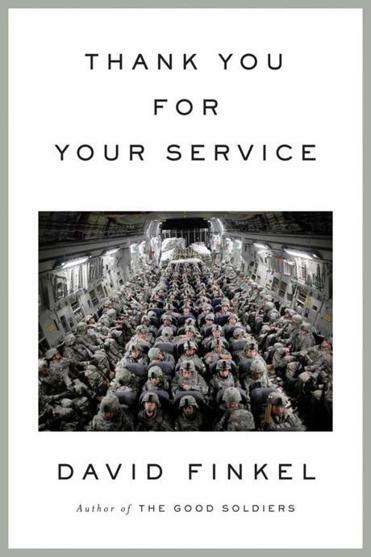 A chronicle of the damaged lives of returning Iraqi war veterans, “Thank You for Your Service” reveals on each page the crushing inadequacy of that traditional salutation for our men and women in uniform. It also illustrates the shortcomings of an overburdened support system, as well as the heroic efforts of individual veterans to reintegrate into society and get on with their lives. And it tells us about those who don’t make it. In his previous book, “The Good Soldiers,” Finkel, a staff writer for The Washington Post, followed the men of the Army’s Second Battalion, 16th Infantry Regiment during its 15-month deployment in Iraq in 2007-08. Now he writes about the “after-war” for some of those same soldiers, novelistically weaving together their overlapping personal stories as well as those of their caregivers, spouses, and commanding officers, looking at day-to-day lives as well as larger policy issues. This is all valuable context, but Finkel’s real achievement is in his portrayal of individual lives. We see the men, their spouses, and their caregivers, both civilian and military. And we meet the widows of soldiers who have fallen, either in battle or by their own hands. Aieti was on patrol in a Humvee that was blown up by a roadside bomb. With a broken leg, he dragged two of his companions from the wreckage. But his recurring nightmare is of the man he didn’t get to: “Harrelson, on fire, asking him, ‘Why didn’t you save me?’ ” Now Aieti is incapacitated by violent rage and confusion. When Schumann isn’t on a patrol where a friend is killed, another soldier tells him, “None of this [expletive] would have happened if you were there.” The statement is meant as a compliment, but Schumann is tortured by it.